Discover Bath gives you as a Year 12 student, meeting relevant academic requirements, a taste of the first year of study at the University of Bath in your chosen subject. Before the residential, we will give you access to some online modules which we encourage you to complete as it will help you prepare for, and make the most out of, the residential. This may include some subject-related reading to help you develop your subject knowledge prior to the residential summer school. During your stay on campus, you will get to take part in a set of first-year undergraduate lectures, workshops and projects such as laboratory experiments. After your stay you will have the opportunity, with support from current undergraduates, to write up your work as a presentation or a report which will be marked to a first-year undergraduate standard. You will develop key skills for success at the University of Bath as well as get a taste of student life on campus and experience lectures, seminars, workshops and the social activities on offer. If you meet our widening participation criteria you will receive a subsidised place (free of charge) on the Discover Bath programme. We want to offer support to parents and carers of all students on the Discover Bath programme. Through an online portal, we will give your parents an introduction and insight into the university processes as well as direct access to University of Bath staff, students, admissions tutors and course tutors to answer any questions or concerns they may have. We will also give them information about what you are doing on the programme, as we are aware that not all students tell their parents what they are doing. Read our student blogs for more insight into student life. Discover Bath gives you as a Year 12 student the opportunity to experience first-year study with direct access to university facilities, resources and expertise and will prepare you for success in Higher Education. Through the residential, Discover Bath will improve your knowledge of the subject and develop your knowledge of teaching and learning on your chosen course at Bath. It will also help you to make an informed choice about your university and course. 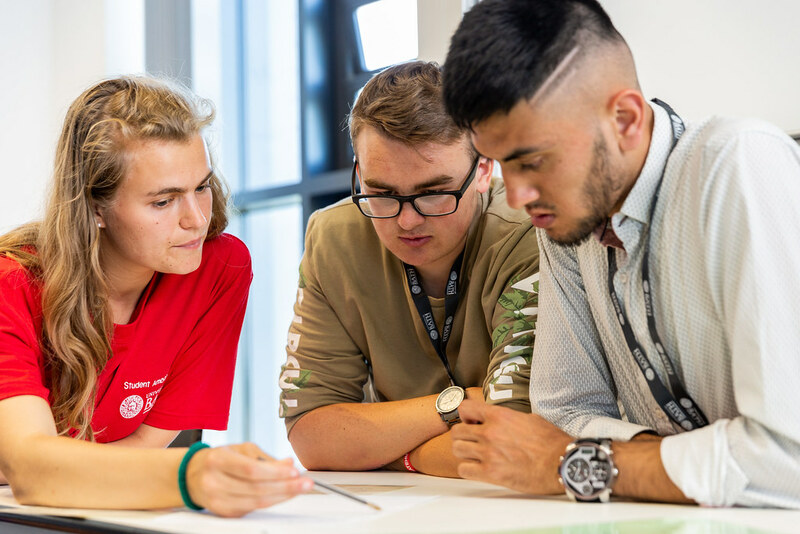 You will get direct access to current students and staff at the University and you will also get advice from admissions tutors and one-to-one personal statement advice to ensure you make a competitive UCAS application. All students who meet our widening participation criteria, successfully complete the Discover Bath programme and apply for a University of Bath course will receive additional consideration at the point of admission. In addition to this, all students who meet our widening participation criteria, complete the programme, attend satisfactorily, write up their work as a report achieving a B/2:1 or above and apply to the University of Bath are then eligible for an alternative offer. This means that if they are made an offer they will receive both the typical and an alternative offer. The alternative offer is usually a reduction by one grade in one of their A levels. For example, AAA would become AAB plus a B in the Discover Bath project. There are limitations and exemptions to the alternative offer. Discover Bath is available to all Year 12 (or equivalent) students who are academically able to study at the University of Bath in their chosen subject. Students who meet one or more of our Widening Participation criteria will be given a subsided place. If you are unsure if you meet the criteria then please email us at outreach@bath.ac.uk and we can check. The standard fee is £225, which covers the cost of accommodation and food throughout your stay. Students who meet our widening participation criteria will receive a subsidised place (free of charge) on the Discover Bath programme. Your accommodation and food throughout your stay will be covered by the University as well as your travel costs to and from the University for the residential stay. How will I know if I've got a subsidised place? We will let you know if and when you are accepted onto the programme whether you have qualified for a subsidised place. You will need to complete the form including details of your parents/carers and teachers. We will then email your parents/carers and teachers to complete a short form too, which will be combined with your responses. We still have some places on Discover Bath for some subjects. Please email campus-events-team@bath.ac.uk if you are interested in applying.